How to get there: The mountain is located west to south-west of Gog. It is east of Tvilling Fjeld. Route description: The mountain has two summits separated by a saddle. I climbed the saddle from the west side (returning from Tvilling Fjeld), then to the south summit. The last part after leaving my skis. Two other members of our team climbed the north summit on the same day. Returning to my skis I skied back to the saddle, then down to Base Camp (fairly steeply) on the east side. 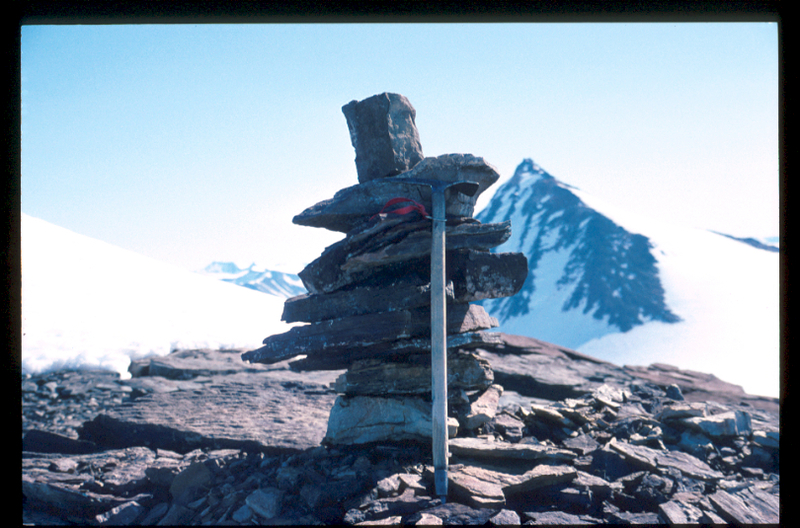 Comments: I built a cairn on the summit that subsequently could be seen from Base Camp. John tried climbing the same summit going straight up (avoiding the saddle), but had a bad crevasse fall on the way. There was also a fairly serious crevasse that we both crossed (on a somewhat shaky snowbridge) near the ridgeline before the ski descent on the east side. After this day even more precautions were taken with regard to crevasse danger, since the team experienced two crevasse falls this day. This late in June after three weeks of continuous, 24 hour sunshine substantially more crevasses started to emerge. The south summit of Hvide Ryg.